Published August 3, 2011 By Anna T. This post may contain affiliate links. Regardless, I only recommend sites I've researched and/or used and trust. While looking for tutoring opportunities to review for you, I found one that seemed pretty interesting! TutorABC hires people to teach English to language students from various countries. The work is done 100 percent remotely. Most of the students know some English, but need help speaking conversational English. I've also read that the majority of people you would be teaching are Asian. Here are some more specifics. How much does Tutor ABC pay? You actually negotiate your rate per class with the company. Once the rate is agreed upon, you will receive monthly payments via either Paypal or bank wire transfer depending on where you live. I've read a few reviews, and people who work for them say they always pay on time. Ability to SPEAK SLOWLY and explain things to people who can't speak ENGLISH! If you're looking for flexibility, you may find TutorABC very much to your liking. They do classes 24 hours per day, 7 days a week, so it should be very easy to find something that works for you. You are required to hold a minimum of 15 tutoring sessions per week, all of which must last for at least 45 minutes. Related: List of flexible work at home jobs. Tutoring for this company works a little differently than it does with most. You'll be teaching a group of students, not just one. You could have as many as six people in your class. These people are not all children — you will be teaching adults in many of the classes between the ages of 22 to 65 years old. You will do the sessions in front of a webcam with a microphone attached. Apparently you can't see the students, but they can see you, which I personally would find a little unsettling — but that's the way it is. After each session, you're subject to student evaluation. Bonuses are possible if your ratings are consistently good. What do people say about TutorABC? This thread on the WAHM forum was very insightful. I suggest you look it over if you are serious about applying here. The company's FAQ page is also very informative and may answer any other questions you might have. For more recent company reviews, I'd suggest browsing Glassdoor here. As you'll see, many workers felt the pay could be better but overall they appreciate getting bonuses and being able to work at home. How do you apply at TutorABC? You can apply here if you're interested! Please keep in mind this is just a review, not an advertisement that this company is hiring. Looking for more ESL jobs from home? 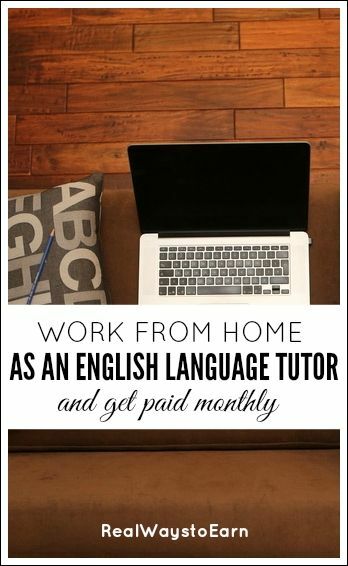 If you're looking for more ESL jobs from home, this is another legit company that is actively looking for online tutors, paying over $14 hourly. I have worked for TUTORABC for several years and am currently looking into other options. The main reason for working for this company as an online consultant would be the convenience of working from home and having some flexibiilty in setting a work schedule. However, I have never worked for a worse company than this when it comes to valuing its employees. – I have not received any personal acknowledgement for my accomplishments, except form letters for achieving higher numbers of sessions taught. – The company pays fast-food worker wages (NON-NEGOTIABLE), but wants native speakers of English, preferably professionals who are willing to work for a low base rate, but receive “bonuses” based on the whims and fancies of the students, who can give you any rating they want, without explanation. This equals a professional working for tips. – The company does not give annual wage increases nor any other benefits, whether regular or performance-based. – They are constanty adding more and more conditions and requirements for their consultants with no corresponding compensation (including now having to work a minimum number of hours on the weekends and during peak hours). -They do not provide any forums or means of establishing contact with other consultants (I suspect because they do not want to facilitate an uprising or mass resignation). Each consultant is entirely isolated from management and colleagues. I would not recommend this company to anyone who considers him/herself a valuable, experienced professional. You will not be appreciated for what you are! Pay-so everyone agrees the base rate pay is awfully low. However, Tutorabc pays me the exact same wage as an international language school would in South Africa and then there’s the extra bonus. Also, I work from home so there is absolutely no money spent on fuel. They pay according to qualifications and nationality( which is weird). Contract: Initially, I was skeptical about the company but they only give you the service agreement in print after you complete and pass the training process and they feel you are ready to teach. So do not stress over that! Students; I’ve had some of the most enjoyable teaching sessions ever, the students are friendly and extremely respectful but they like to know and feel like they actually learning. The whole rating system is pretty odd but if you feel like you received an unfair rating just contact them….all classes are recorded and they will review it. They do care more for what their students have to say but then again, every company cares more for the party that’s bringing in the cash. IT requirements: So I actually failed the technical test the first time since I did not want them to sort of control my PC but it’s actually no big deal. They use the same software all computer repair stores use and if you really not comfortable here’s a tip; move all your personal info on a usb for that moment. You will be able to see everything they do while carrying out the test. Wifi is a huge no and you need to have a wired line…There’s an internet router in almost every home nowadays so you won’t be paying any additional fees if you have one. Teaching style: You just can’t be slept away, these students are damn clever when it comes to grammar, you need to be vibrant and respectful ( can leave you drained at times). I am also based in SA and looking to get into contact with others that were interviewed, just to chat and discuss how legit this company is. Was very sceptical when they requested remote access to my pc. Please email me on bvawda (at) hotmail (dot) com. I see many have mentioned other options with other companies. PLEASE could you provide me with info in order to apply as I do need the work, but now after reading all this on TutorGroup, I am hesitant to take the process further with them. I also notice that we in South Africa are being offered an even lower base pay rate per hour. I also read the service Agreement and have to say there are a number of Red flags in there too that I had to question and am awaiting response. Please could someone come back to me re other online teaching options. Someone Mentioned JAPAN for $16 per hour but gave no further details. Perhaps I do just need to set up my own system. I’ve been working for TutorABC for about one year now and everything seems to be alright. Sure there are a few flaws here and there and the pay might be a little low, but then again there is no perfect company out there. One thing I don’t like is the fact that I have to work on weekends, specifically on saturday morning. Other than that the students are really nice, sometimes the sessions are fun, there is no boss to deal with, it’s a pretty simple job. What I really like about this job is that I can teach anywhere in the world. I bought a portable modem (which I adapted with some other hardware) that I carry around with my computer and all I have to do is keep track of time wherever I go. Just last week I was on vacation in the western mexican mountain range near indigenous communities that have no internet access whatsoever and I was able to teach perfectly fine. The job is not over difficult, but it is tiring managing groups of mainland students especially. You will be exhausted when your shift is over, and you will feel bitter knowing that it was all for peanuts. There are schools out there paying a fair wage, you need to do a little research however. But many will try to entice you with the promises of bonuses and such that just don’t add up. I encourage professional teachers not to support any of the companies out there that pay less than a living wage as it drags all of us down. I hear ya Steve, however I do not see anyone presenting alternatives. Some people like working them, some do not, but I do not see people having experienced working with other companies to be able to see the difference. Also, there is a difference between holding someones hand and actually teaching them. If they are paying you for the latter then the money is not good enough, but I do not think that is the case. Will give them a try and see whats what. They will try to sell you on the bonus as well. More smoke and mirrors. Your bonus is based on the average rating of the session, and they always round down in full points, not from the nearest half point as you might have learned in elementary math class. Students almost never give a 9 or 10 rating, and if just one student gives you a sub seven say goodbye to your bonus. If even one student gives you a five or lower then you will be paid half the base rate. IE, if four students gave you a ten and one a five, you would get 4.25 for the hour. If your average rating for a session is a 7.9, they round down to 7 instead of up to 8, meaning if four students rate you 8 and one a 7, no bonus. They always round down, which means you will never get a fair bonus because there is always at least one snotty student. The pay is simply too low to make this job worthwhile. Allie states that it’s only 45 minutes work, but that is not really true. You are required to be at your camera five minutes prior to the start of the session. The students often have questions that run through the 45 minutes and management encourages teachers to be cordial. Then there is the task of filling out forms and writing comments on the students performance, which takes place after the 45 minute session, and it takes more than 60 seconds to do this for a group of five students, more like 60 seconds per student if your comments are to be at all thoughtful. Essentially, you are working the full hour with a five minute break. If you are scheduled for a five our session, you will be working for five hours, yet you will be paid for four. I’ve been working for TutorABC for 3 months now and have had no problems. They do frequently ask you to pick up additional shifts, but I’ve never had an issue with them being rude to me when I said no (which has been every time but twice). After taxes taken out for Taiwan business purposes, and after the Paypal fee, I average about $8.80 an hour. My overall rating with the company is a 9.18 so I frequently get bonuses that are higher than $0.50. You get a bonus for each student in the class that gives you a good rating, so technically you could get a $6 bonus on top of the $8.00 for 45 minutes of work. However, that is nearly impossible. The highest I’ve gotten is a $4 bonus. The average rating for teachers is an 8.8. If you are below that, chances are you will get fired. I had my recruiter send me an email the second week I worked there complaining that I was below the average (I had an 8.68 average). It greatly irritated me, but within the next week my rating was up and she never said anything about it again. You will get snotty students, but overall they are very nice. If you disagree with a low rating, you can “challenge” it, and the company will review the tapes and oftentimes remove the rating for you. They say you can only do this for one rating a month but my friend who also works for them did this on several occasions last month with no problems. A lot of the students have understood that the technical issues are with TutorABC or on their end and are no fault of my own. It’s pretty easy money. You basically get paid to smile for 45 minutes and gently correct students as they read and talk to each other, and break down words into very simplified definitions for them. Once you get used to the format, the progress report at the end of class takes all of 60 seconds to fill out. I must admit, it was a bit strange the first class to only see myself on the webcam, but I quickly got used to it. And, considering the company teaches children as well as adults, I understand the privacy concern they have and can see why the webcam is only on on the teacher’s end. I’m sure you could find higher paying jobs, but it works well for me since I now love abroad in an underdeveloped country and am looking for just a little extra income every month to help me stretch my savings. Can you tell us which schools you recommend? After reading this thread I’m hoping that tutorabc doesn’t contact me but I now need some alternatives! I would not recommend working for this company. It can be very stressful teaching a class of six or more students from mainland China who have been promised more by Tutorgroup’s salespeople than they receive. And it’s just not worth it for 8.50 per hour. I earned that working at a grocery store 25 years ago. You might get on average 50 cents bonus per lesson, however, if a student gives you a low mark you only get 50% of your rate, ie, $4.25 per hour, and it does happen frequently due to overselling by the salespeople. After you get taxed by the Taiwan government, and deduct transfer fees by paypal (they do not send via friend to friend so a percentage is ALWAYS taken) or bank wire, you are looking at about 8$ hour, bonuses included. It’s just not worth it. There are many more schools out there paying at or above minimum wage, and which don’t require a degree. Highly suggest you avoid any company that offers slave wages. You won’t be happy. Please read this before getting involved with this company. My advice is to stay away. They will waste your time and give you the biggest headache ever. You will be tired from just dealing with their nonsense and petty self-induced crisis situations. They will constantly beg you to work additional sessions at hours that are inconvenient for you. The job involves too much sitting. Another thing it is disconcerting to have them see you on webcam, but you are unable to see the students and will not be allowed to see anyone from their company on webcam. I felt like a criminal in the one-way glass. I do not believe they really respect people and suspected they have resentments toward people in the U.S.A. and Europe. I felt that from several of their students as well. Several of their students, particularly the women seemed very unhappy and bitter about life in general. A few said they would never want to be a woman again if they had to do things over because men have life much better than women in their society. If you work for them then, you will encounter nothing but constant humiliation…Is this Asian culture? I worked with various Asian people for 10 years and never encountered this kind of behavior, so I do not buy that reason from one of the previous people in this forum. Seth said the same thing. He worked in China for several years. These people are down right rude. I sensed there are also some deep rooted hatred toward other Asian and other cultures and political issues that their country is involved in. They are not fond of Americans. My advice is to stay away from them. They will waste your time on the interview process and when you work for them, they will drain your energy. The people who work for them and things are going great, then more power to you and that is okay. I wish you luck in your continued work for them. I am submitting this information for people who are asking and providing my experience with this company. One thing that I did realize is they do not have enough people to work for the number of students. This is because I believe they have a high turnover of ‘consultants’ (tutors), due to the way they treat people. In the interview process you will be put on hold for 10 to 45 minutes waiting for the recruiter and IT people to come back to your interview. Training is awful. The recruiter speeds through the training when they hire you and gives you the most important information in lightening speed and tells you to take notes. They make up rules as they go along when you work for them and are very dishonest about things. You learn their rules as you go along because they do not tell you all of the details up front when hired. They will never admit that they or their clients are wrong. I believe the recruiters make commission on the number of hours you work. That was my suspicion. I worked almost a year for them and absolutely agree with Rita Rin, Danielle, Marlon, Ashleigh, and Seth. Their system has technical difficulties and they chastise you for it and the students rate you low, which means your pay is lower. The money is not worth the total headache you will end up with from this company. As Danielle said in her post, you will never be good enough for these people. Asian culture or not, if you do not mind being totally humiliated and lied to, then go ahead and work for them. In my opinion, they are by far the WORST company that I have encountered in my entire life. I would not recommend them to anyone, ever! Several of their students are very nice, humble, and eager to learn English, but there are several who are not nice at all. They seem to have no in-between people. They seem to be either very nice or very much the opposite. Some of the students will play along with you and say terrible things about you behind your back. There were a good handful of students who seemed to really enjoy doing behind your back thing because the average ratings they gave tutors were very low. My advice is to find another company that pays better because what you actually make will come out to about $8.50 due to their taxes that you pay, money transfer or PayPal fees, and the down rating reviews from a few lying and dishonest students. Someone told me there is a Korean company that you can talk on the phone with students for about 20 minutes that is pretty good to work for, but do not know the name. You may want to Google it, but better yet, set up your own teaching business using Skype. It seems that a lot of people do it that way. Contact PayPal because they make it really easy to receive your payments and will confirm with you when your students’ payments have cleared, so that you know it is okay to give the lesson. Save yourself the headache with these people! I recently attempted to interview with Tutor ABC and since I did not have a wired connection at first, they were extremely rude. The staff has little knowledge of technology and they aren’t concerned about finding good teachers, they are just concerned about following their policies. I taught in China for three years and I have 10 years of teaching experience, but they cut me off and terminated the interview after I found out a way of establishing a wired connection. They said that my response was unacceptable, or that it is not possible that I could have found a way to wire my connection. The recruiter, Emily, claimed I was unsuited for the job even though she knew nothing of me. I do not suggest working for this company and expect they will delete any comments that are honest. I worked for TutorABC for about two months before quitting. It took forever to get the specs up to where they wanted it to be. Then when I started teaching I would have students who were having technical difficulties and rated me down for it. As such if you get rated a certain way (even if it’s untrue) your pay is based off that rating. I had people IMing me even when I wasn’t online begging me to work and then getting mad that I didn’t respond. Beware. The one positive thing I can say is they paid on time. I love TutorABC. I was a little confused at first since it was the first time I have ever done anything like this. The people I work with are amazing. The managers the IT staff are very nice and will help you in whatever you need. I have worked for the last 4 months and have really high ratings with the students. Some of them even make requests for me to teach them. Not all the students will like your style of teaching, sometimes you will get that one student in the classroom of 6 that will rate you 7-10 while all the other gave you 9 and 10, don’t let that get you down. It is a fun job to do and very easy. The pay for some will be low, but for college students that have nothing better to do during the holiday this is PERFECT!… its your small part time job from home. The peak hours to teach are either early in the morning or late at night due to the time difference, but you can make up your own schedule. I am enjoying it, as long as you follow the rules and don’t screw up on something big e.g. not showing up for class without letting them know, you will be alright! I agree w/ you completely. It seems to me that a lot of the complaints ppl are making are from ppl who probably weren’t that good at it. Tutor Abc is not a reputable company. There recruiting process is atrocious. They wanted to interview me for the position so they gave me a time to be online. I logged in on time and was waiting 10 minutes for someone to show up. When they finally did, they then told me to wait a few more minutes because she had to take care of something. The woman had me waiting there for 30 minutes. I went through the interview when she finally got back. She then told me to log in the next day for a second interview, which I did. Then she told me I did well and had an IT person install their program on my computer (which took longer than necessary because the IT guy also had me waiting while he took care of something else) only to tell me a week later that I didn’t get the job. My question is, why install software on my computer only to not hire me? Horrible, horrible company. I hear your complaints. But a lot of them are more complaints against Asian culture than TutorABC. I taught for them for 3 years, after already teaching in South Korea for 2 years. A lot of what you said is really just how business is done in East Asia. So, knowing that, I guess it didn’t really bother me a lot. I have worked for tutorabc in the past. I don’t believe it is worth it for $8.00 or the 50 cent “bonuses” they give. They did not treat me well nor were they friendly. there are a few japanese companies which pay around $16 for online tutoring. Oh, thank you! I didn’t realize there were bonuses. That makes this an even more attractive work at home job. Someone just asked me about online tutoring jobs and the only thing that I was able to come up with was Tutor Vista. I’ll share this post with others in my network. I do have a 4 year degree in Business Admin/HR. Is this something that I should look in to??? Are there more requirements that I will need to have? Getting your application in couldn’t hurt. I worked part-time for TutorABC for almost 3 years. I really enjoyed it. I never had any real problems w/ them (some small stuff, which you would have with any employer). The base pay wasn’t great, but you get bonuses based on how the clients rate you. Since there is no prep work and you only have to fill out a quick progress report for each student for each session, it is actually pretty easy work. Plus, you get to meet and chat w/ people from different countries, learn about another culture, teach at home in your underwear (lol), get some online and ESL teaching experience, and they are very flexible when it comes to scheduling (which is what I liked most- you can pick up extra session frequently). I have recommended it to friends and I would again. I couldn’t do it as a full-time job. You’d have to tutor 10+ hours/day and at least 6days/week – that’s a lot of sitting for me. Maybe if I built one of those office spaces on a treadmill. Definitely a great p/t job though.